NAIL OF THE DAY. RIMMEL LONDON. INSTYLE CORAL. | Life Looks Perfect. NAIL OF THE DAY. RIMMEL LONDON. INSTYLE CORAL. Well hello summer in a bottle! Today's Nail of the day is from the fab and trusty Rimmel London 60 second range. We have a huuuuge collection from this nail range, we hate waiting around for wet nails so this fab quick drying polish is a must-have for us two. We love a bright nail and with the sun on it's way what a better way to bring some colour to your style than on your nails. 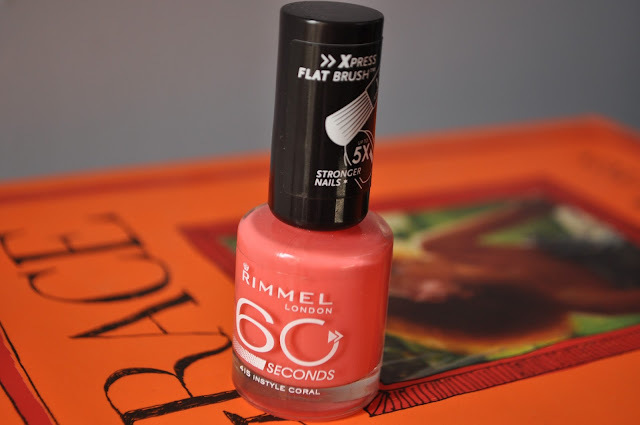 This is Rimmel's Instyle Coral, which actually says it all on the tin really hehe. We always have to have a giggle at nail varnish names sometimes, as some of them are just so silly. But we do admit, with the size and scale of collection's these days, we would definitely struggle to think of names too! That's why we do think over here on Life Looks Perfect, that Nails Inc does it best with their London street names. For us they are great as we tend to find them even easier to remember being Landan gals! This nail shade from Rimmel is a beautiful warm orange/ pinky coral, which applies effortlessly onto your nail. We love the size and shape of the brush in Rimmel's 60 second range, as mentioned before as it is just wide and flat enough to cover the entire nail in one stroke. We usually use two coats of this polish ans finish with a top coat. Our favourite is the Nails Inc Kensington Caviar Gel Effect Top coat, which leaves your nails very shiny and almost chip free. This shade is perfect for your summer hols and Jess has already bagged it for her trip to Rome and Thailand! (Sorry for the old school lingo hehe). Have you got any fab summer holiday's planned?